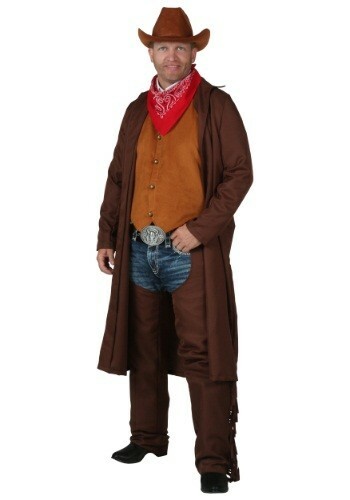 When you wear a costume as authentic as this Plus Size Rancher Cowboy Costume, there's no way you won't have the urge to sing a few old western tunes while leading cattle across the plains. Do you sometimes think about selling everything and heading out west to buy your own dude ranch? Can you see yourself riding the open range, checking on cattle and mending fences? Of course but does your spouse see it? Perhaps you should put on this plus size rancher cowboy costume to give her a better visual. Once she sees that you can indeed look like a real cowboy she'll believe you can be one too!